Yee Ho Lee Photo, 1918, Chinese Exclusion Act case files, RG 85, National Archives-Seattle, Yee Ho Lee file, Box 585, Case 7030/5241. Yee Ho Lee Photos, 1933, Chinese Exclusion Act case files, RG 85, National Archives-Seattle, Yee Ho Lee file, Box 585, Case 7030/5241. 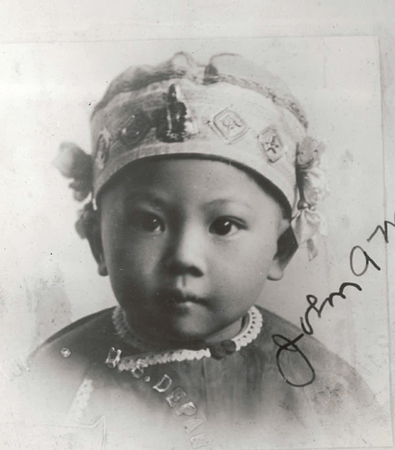 American-born Yee Ho Lee left the United States for China with her family in 1918 when she was almost four years old. When she returned fifteen years later as the bride of Wong Shew Leung, a Boston merchant, the immigration inspectors did not think she was the person she claimed to be. They wanted her deported. She looked younger than her stated age; her ears did to not match the ears of the child in the photo. According to experts ears of a certain type do not change as one gets older. It was noted that the child had large flat lobes sticking out from the checks but the young woman did not have a distinct earlobe and the ear tapered “gradually from the top to the bottom and coming to a point at the cheek.” They also thought there was a difference in the eyes, the lower lip, the eyebrows and the nose. 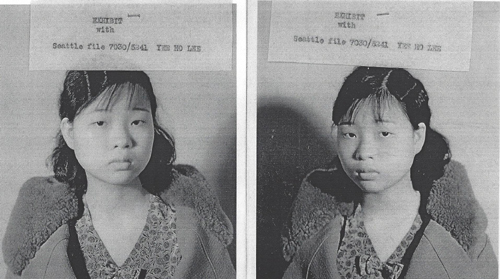 Included in the files are exhibits of photographs, her birth certificate, and witness statements from twenty-two Chinese, many of them siblings of Yee Ho Lee. A summary of the case is five pages long. An appeal was made by Fred H. Lysons, attorney for Yee Ho Lee’s husband and the decision was reversed. The contours of the lips of the young woman were compared to those of the child and it was decided that they belonged to the same person. Yee Ho Lee was finally admitted on 13 May 1933. 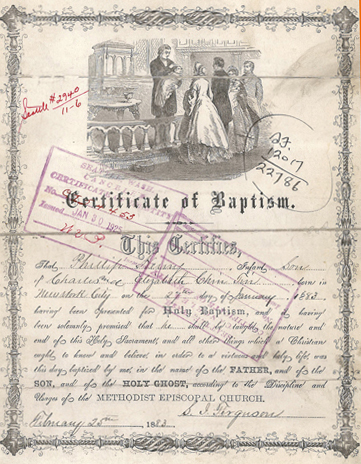 “Certificate of Baptism,” 1883, Chinese Exclusion Act case files, RG 85, National Archives-Seattle, Philip Henry Chin (Chin Shew Hing) file, Seattle, Box1194, Case 12969/15-6. A few years later the family moved to San Francisco. Philip applied for a return certificate in 1923. He stated that his mother died in 1887 and his father died in 1891; both died in San Francisco. Philip lived with his older brother, Harry Chin (Chin Shew Yick) after their parents died. Philip and his brother moved to Chicago about 1892, a year before the World’s Fair. Harry was eight years older that Philip. The Department of Health, City of New York, Borough of Manhattan searched their records but could not find a copy of Philip’s birth certificate. On 30 January 1925, Philip used his baptismal certificate to prove his birth in order to obtain his Certificate of Identity # 54453. 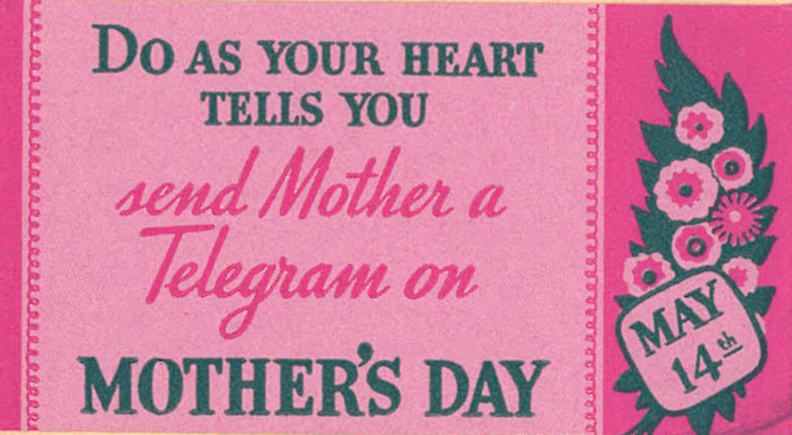 According to William H. Tomkins, Immigrant Inspector, San Francisco, “…that the alleged mother was a white woman.” “The applicant seems to have full command of the English language, that is a further point consistent with being born to a white mother.” The mother’s name is not given. Tomkins recommended that the application be approved. 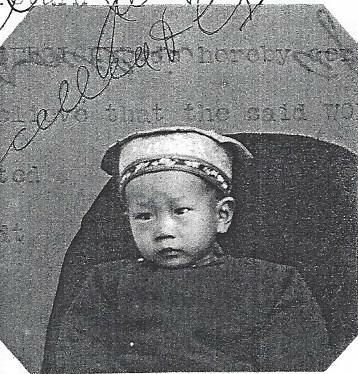 Philip Henry Chin left for China in 1923 and returned through Seattle on 4 January 1925. He was married to Wang Shee while in China and his marriage name became Chung Hing. 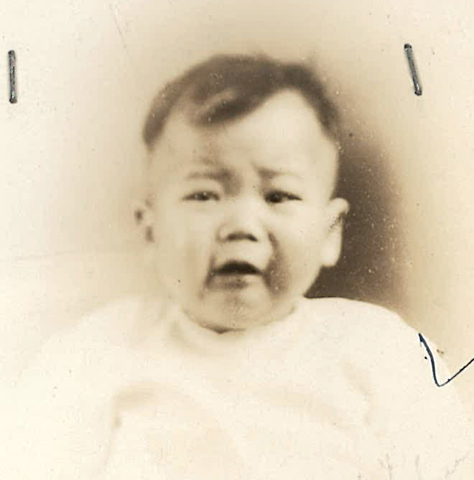 He made another trip to China in 1928 and when he returned through Seattle on 30 May 1930 he reported that he had a two-year old son named Wee Lee in China.